David Dvore is the Town and Delegate Liaison for WiredWest. Check Recent Info for various documents as they become available. Please share the following information with your town officials. 1. Review the Commonwealth of Massachusetts Open Meeting Law Guide and complete and submit the Acknowledgment of Receipt Form (OML). 2. Review the Commonwealth of Massachusetts Summary of Conflict of Interest Law for Municipal Employees and complete and submit the Acknowledgment of Receipt of Conflict of Interest Materials. 3. Completion of State Ethics online training and submission of completion certificate. All required submissions in #1 to #3 above should be given to the WiredWest Clerk. They can be mailed to: WiredWest, Attn: Clerk, Old Courthouse, 99 Main Street, Northampton, MA, 01060. Note that some of the documents below will need to be customized to reflect your town-specific details. Look for information marked in <bold>. 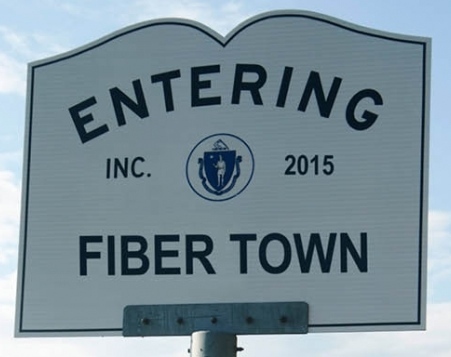 These graphics are available for delegates to use in materials, and on town websites to support the Fiber Town campaign. Images must remain intact and not have the scale or content manipulated. To see if the Town will vote to authorize the Board of Selectmen to take all necessary and appropriate action to establish and to maintain, in accordance with the provisions of Chapter 164 of the General Laws and in accordance with the rules, regulations and orders of the Department of Public Utilities and the Department of Telecommunications & Cable, a municipal lighting plant for all purposes allowable under the laws of the Commonwealth, including without limitation the operation of a telecommunications system and any related services, or to take any other action relative thereto. Double-sided Municipal Lighting Plant information sheet for distribution at town meetings and information sessions This piece can be used at town meetings (if allowed), pre-meeting information sessions, and copies can be placed in town halls, libraries and other town meeting venues. MLP Article for Town Newsletters This can be submitted to online and/or printed town newsletters. Please note the last paragraph where you will need to insert your name as the WiredWest town delegate.